After 355 days, our spring cria decided to make an appearance! His dam, Oh My Oh My, (aka Pea) was a first time mom so we were watching her closely. Finally the day came when he was ready to make his appearance. Our normal policy is to intervene only when absolutely necessary. Mom was having to work very hard before the nose finally appeared and then the whole head and finally, the toes. With the head and legs out but no more progress we decided that mom might need a little help with the shoulders. 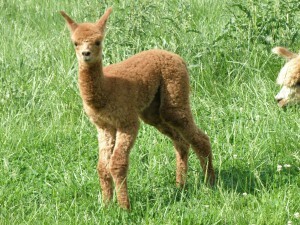 Normally once the shoulders are out the cria drops to the ground. In this case it was the dam who dropped to the ground and keeled over! Now there was no gravity to help with the rest of the baby. 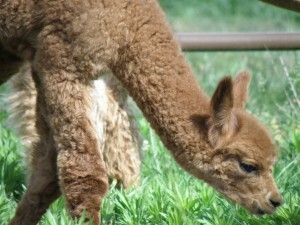 It took another couple of minutes of gently pulling in time with her contractions before the cria was finally delivered. Once he was on the ground it was obvious why she had had to work so hard. He was a large baby with very long legs. He weighed in at 19 lbs. He was a beautiful copper color, darker than his dam or sire. Although she was a first time mom, Pea had obviously read the book on how to be a good mom. She fussed over him immediately and later stood still when he was learning where the milk bar was. She is proving to be an exceptional dam. 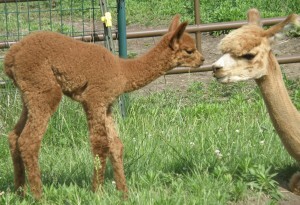 The last two crias we have had were born to moms who had no milk and initially rejected their babies. It was such a relief to have everything work out as it should! The as yet unnamed cria is making good progress and runs around happily with Mighty Mouse our surprise fall cria. Although she is much bigger than him she treats him very gently. His fiber is already showing density and architecture. We are very happy with this little male.